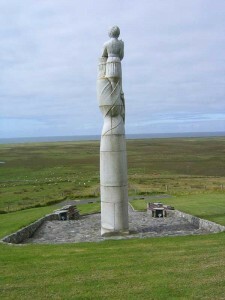 The Statue of Our Lady of the Isles is 30ft high depiction in granite of the Madonna and Child which was erected on the western slope of Rueval at a height of 170ft above sea level in 1957. It was the work of the sculptor Hew Lorimer and is regarded as one of his finest works. It is 9m (30 feet) in height and carved from granite. Lorimer gave the Madonna the face of a typical island woman and was commissioned by Father John Morrison and paid for by the people of the island.